Snow-covered roads. Whiteouts. Black ice. All are situations that we are now all dealing with this winter. Winter came … all at once. And it’s not over yet! Road salt definitely helps make the roads safer. A study conducted by Marquette University found that de-icing winter roads with salt reduces accidents by 88 percent and 85 percent. Each year, state and local agencies spend more than $2.3 billion on snow and ice control operations. As helpful as road salt can be for the safety of drivers, there is a downside. Chemical reactions can corrode your car. This is especially true if you have any exposed metal on your car. Give your car a good wash and wax. For the best protection, apply a wax sealant over your wax. 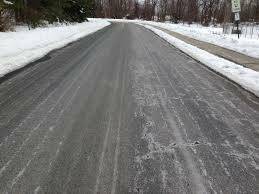 Have any scrapes, chips or rust spots repaired before the first snow falls. Refrain from driving behind trucks spreading ice or brine. Get regular car washes. Spray your car down at least once a week if a lot of snow falls. Invest in a wash that cleans the undercarriage of the car at least every few weeks. Give older cars some extra TLC. The National Highway Traffic Safety Administration says that cars are especially susceptible to corrosion after being exposed to road salt for eight years or more.